In the nature of the horse there is a duplicity that, for better or worse, has a deep impact on the relationship of this animal with man. In the second half of the sixteenth century, Claudio Corte had already described exactly this ambivalence. 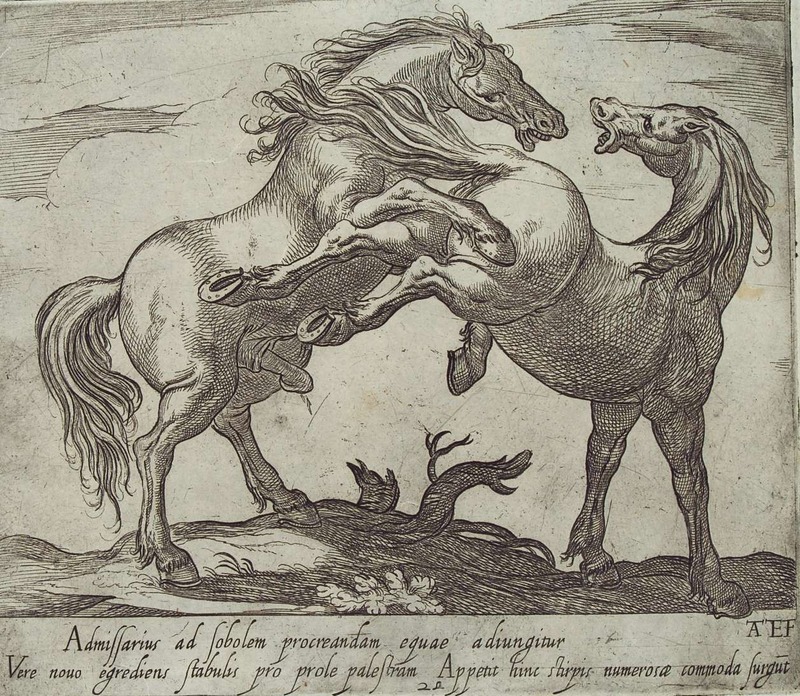 The horse – Corte wrote in his book Il cavallarizzo (The Horseman) – incorporates both “the nature of a domestic and gentle animal and that of a wild beast” (CORTE, 1562, p. 11v). There is indeed something primordial and savage in the powerful instincts that dominate the emotional reactions of the horse and that clash with his docile and gregarious nature. His seemingly incomprehensible fears are bewildering, in contrast to deeds of unprecedented courage. The violence of his sexual instinct is surprising and make him – again in the words of Corte – an “animal very fit for coitus and very inclined to love” (CORTE, 1562, p. 18r). His size and strength inspire fear, though a competent and sensitive hand can direct his generous impulses. 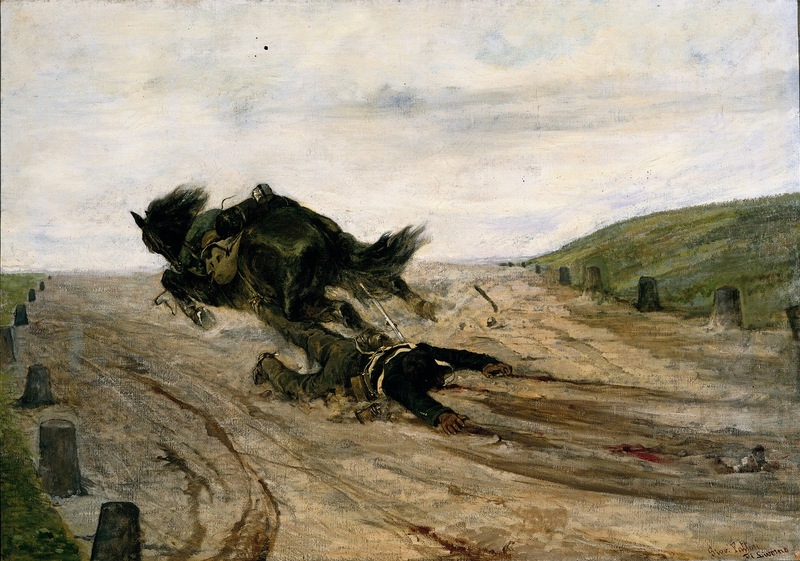 Even the genial French horseman-artist Bartabas recognizes that the source of his equestrian vocation is a primitive instinct of fear of the horse. The relationship between man and horse is modeled by this complexity. The conflict between fascination and fear lurks in the unconscious of every rider: it feeds his passion, points him toward new goals to reach, but it also multiplies his inhibitions and it is the cause of the most common technical and management mistakes. “Fear – writes Michel Henriquet, after a life dedicated to the practice and the teaching the equestrian art – is the most common problem of those who practice horse riding” (HENRIQUET, 2006, p. 46). According to the French master, this paralyzing feeling grips the vast majority of practitioners (six or seven out of ten, in his own experience as a instructor). And we might add, that it does not matter if they are beginners or experienced riders. Of course, the familiarity with the animals attenuates the fright, but very often it is easy to guess the influence of an unconscious fear even in the attitudes of many professionals. Given these considerations it is therefore not surprising that a large part of the Livro da Ensinança de Bem Cavalgar Toda Sela (The Book of Riding with Every Kind of Saddle) – one of the first equestrian treatises, written in the mid-fifteenth century by King Edward I of Portugal, known as Dom Duarte – is dedicated just to the management of the fear that the horse inspires in his rider. A special feature that makes this book – in the beautiful definition given by the Portuguese scholar Carlos Henriques Pereira – “the first page in history of psychology applied to equestrian sports and probably of sport’s pedagogy in general” (PEREIRA, 2009, p. 141 ). Not to fear falling off the beast or with her, keeping the appropriate confidence in yourself, the beast and the terrain where you are riding, to do whatever would be necessary (DOM DUARTE, 2005, p. 18). According to Dom Duarte to not be afraid of falling is a fundamental virtue of a good rider. Giovanni Fattori, Man caught in a stirrup, 1880, Galleria d’Arte Moderna, Palazzo Pitti, Firenze. Two in particular are the faculties that, according to Dom Duarte, the rider must cultivate in order to overcome the instinctive fear that the horse inspires him: knowledge and will. The first is the most effective antidote, but cannot be achieved without the latter. In fact, by understanding deeply the animal and the techniques to influence and steer his behaviors, you can overcome the fear of his reactions and prevent the potential risks which may arise from those same reactions. In riding, like in all the things we want to do, if fear makes us unable to do it well we should, first of all, learn how to do it better; and if we know how to do it well, we will have the aforementioned presumption which in itself normally causes most or all the fear to vanish (DOM DUARTE, 2005, p. 45). However, the equestrian universe is complicated and somewhat mysterious. Complicated primarily because each horse, while sharing some basic features with his fellows, is distinguished by its peculiar feeling, attitude and physical conformation. Mysterious, because the animal communicates with us only through his body and we can interpret his signs only through our experience and intuition. In horseback riding, our own body is an instrument of communication with the horse, and the rider must therefore enforce to himself a thorough physical discipline to control his attitudes and thus make his signals (i.e. the aids by mean of which he directs his mount) clear and unique. To achieve true expertise in the equestrian field is, therefore, a long and constantly perfectible process that can be undertaken only if motivated by a inexhaustible desire to improve. According to Dom Duarte, the will is therefore the essential virtue to overcome fear and achieve true competence. Nobody should doubt that if someone desires to become a good horseman, his will would be sufficient to enable him to overcome the fear of falling from the horse – or with it – and therefore he will end up being a good horseman (DOM DUARTE, 2005, p. 46). of communication with the horse. 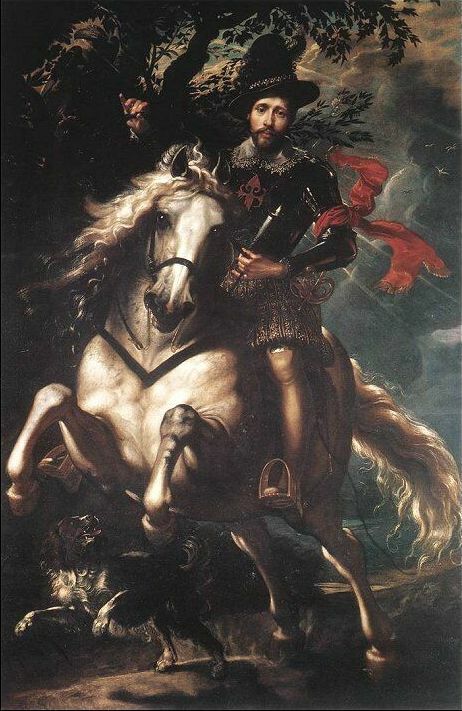 Pieter Paul Rubens, Equestrian portrait of Giancarlo Doria, 1606, Galleria Nazionale Palazzo Spinola, Genova. It is possible to show off our safety when we are doing specific things, faking it through the use of specific attitudes that normally reflect safety. That ability is not only useful to deceive others; if we do it frequently, these activities might become a habit and eventually convince our heart; we could end up really feeling safe. (DOM DUARTE, 2005, p. 59). This is one of the most curious and interesting aspects of the inner discipline that the rider must impose to himself to overcome his fears. Dissimulation thus becomes a tool for self-persuasion. And in this regard, Duarte lists some “tricks” that the shrewd rider can use to hide his embarrassment when he is in danger. 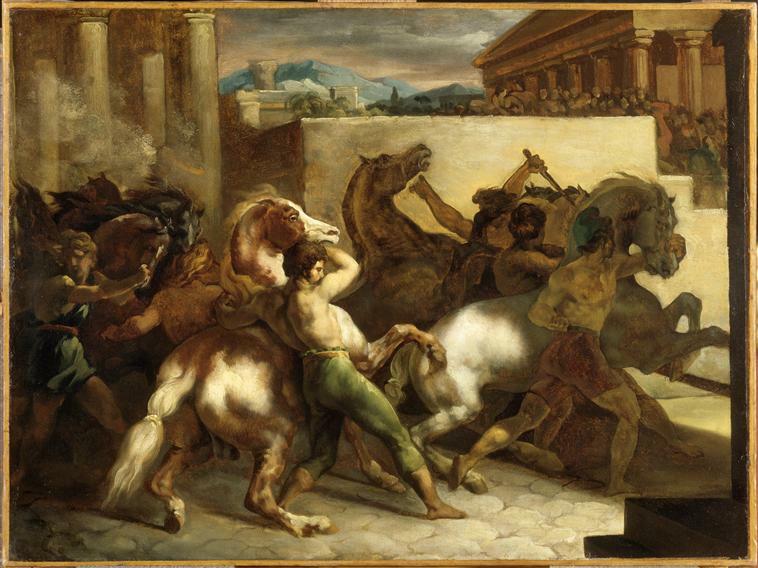 For example, when riding an unruly horse, he must show a quiet and pleasant attitude (but always, not exaggerating, in order to avoid affectation) and if the horse rears, bucks or kicks, he must tidy his dress and mantle, with a slow and calm movement, as would a horseman that is not at all worried about what is happening. Similarly, if he needs to correct the horse with the bit or with a more energetic use of his legs and spurs, he must do it by continuing to talk about this and that with other people, as if nothing disturbs the conversation. 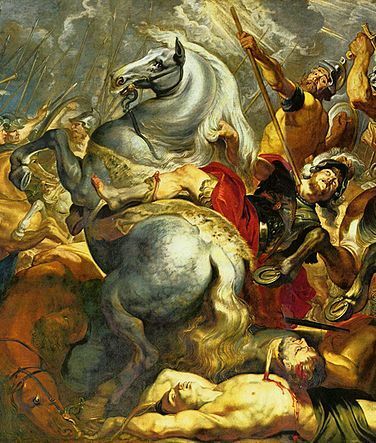 Peter Paul Rubens, Publius Decius Mure’s death (detail), 1617, Fürstlich Lichtensteinische Gemäldegalerie. But there is one aspect that the discourse of Dom Duarte does not touch, but which, in my opinion, is particularly relevant in reflecting on the fear that horses inspire in men. That secret fear, which often unwittingly undermines even the most genuine horse lover and many equestrian professionals, pushes many of those who deal with horses to an excessive use of force. The violence towards horses is, in fact, always the expression of the fear of not being able to control them by other means, and of the ignorance of more effective and appropriate ways to do it. And for violence here, I mean, not only the use of beatings and other abuses, but also an inappropriate overuse of the aids. 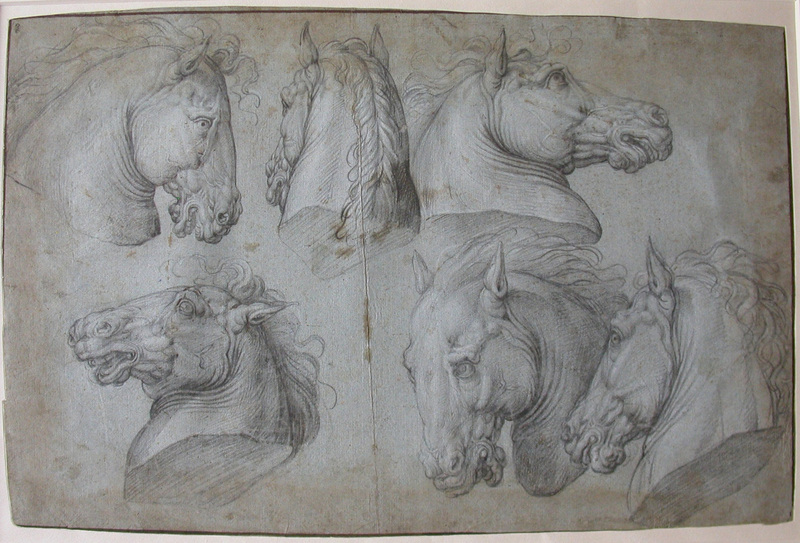 Cesare Fiaschi, at the half point of the sixteenth century, and many other Renaissance authors had already understood that the horse is an extraordinarily sensitive animal with which the rider often tends to communicate by too strong means, which then turns into useless and counterproductive violence. Fear leads inevitably to a lack of observation of the behavior of the animal and is generally exorcised by brutality, or at least by far more aggressive manners than necessary, which then establish a vicious cycle of human actions and reactions of the animal that are the source of endless misunderstandings and repeated failures. and learn to trust himself and his horse. 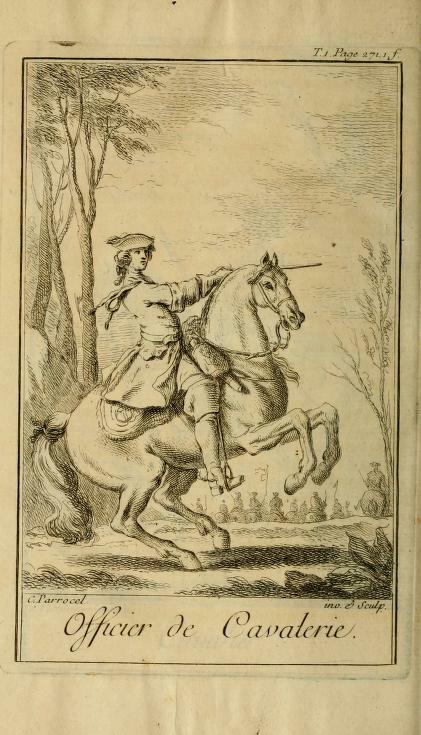 Carles Parrocel, Cavalry officer, in F. R. de La Guérinière, Ecole de cavalerie, Paris, 1736, p. 271. The knowledge accumulated over thousands of years of co-existence between man and horse, which is handed down to us by the equestrian literature, teaches us that in order to reach excellence the rider must overcome his fears and learn to trust himself and his horse. The essence of the more sophisticated art of riding is in this inner confidence and in this trust, which lead man to reward the availability of the animal to cooperate by leaving him as free as possible to express his physical potential, without unnecessary constraints. This is the lesson of the “descent de main” mentioned by La Guérinière: the reward given by one of “the most subtle and most useful aids of Chivalry” (LA GUÉRINIÈRE, 1733, II, 7, p.89). As soon as the horse gives up resisting to the will of the rider, the latter leaves him “in freedom on one’s word”: that is to say, that he ceases the aids by means of which he controls the horse and permits him to carry himself. It is in that moment that the animal is able to express his elegance, his strength and agility at best. 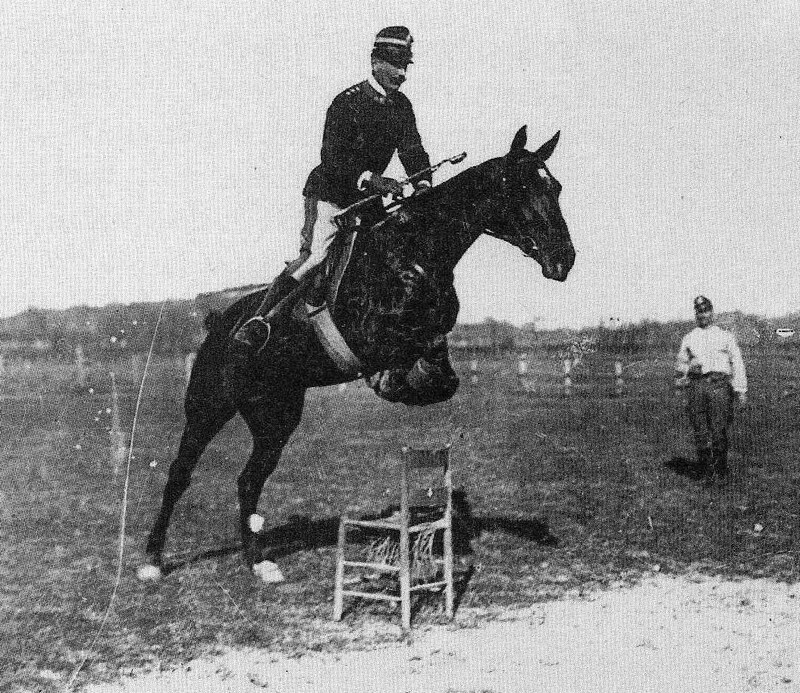 It is basically the same confidence that leads the rider to advance his hands to give “freedom to the horse’s neck” over the obstacle in the “natural system of equitation” by Federico Caprilli. This lead a revolution that, in the short span of two decades, between the nineteenth and the twentieth century, allowed the horse to pass over obstacles of more or less 4 feet to barriers of more than 8. Even in this case, the rider must overcome his fear and the obsession of control and rely on the generous vitality of the animal, to become one with him and thus acquire the same power and grace of his mount. and rely on the generous vitality of the animal. Federico Caprilli, jumping a chair in an open field. Therefore, there is no high equitation without reflection and study, that is to say without working on ourselves to supplement and perfect the physical training and the technical learning. To overcome his fears and learn by observing his partner, in order to comply with his good inclinations and correct his shortcomings, the rider must undergo an endless initiation. “The act of riding – writes Michel Henriquet – is a sport with regard to the methodical practice of exercises that increase the strength, dexterity and beauty of the gestures; but it also tends toward a moral end that combines the perfection of the body with the education of the spirit”(Henriquet, 2006, p. 55). The daily interaction with another being, with whom we cannot communicate through language, but with whom we have to establish an understanding based on mutual comprehension, becomes then much more than a competitive sport or a recreational activity. It is a way of cultivating our soul and an opportunity to grow as women and men, and not only as riders. BARTABAS, Manifeste per la vie d’artiste, Paris, Éditions Autrement, 2012. CORTE, Claudio, Il Cavallarizzo, Venezia, Giordano Zilletti, 1562. Dom DUARTE, The Royal Book of Jousting, Horsemanship and Knightly Combat. A transaltion into English of King’Dom Duarte’s 1438 Treatise Livro da Ensinança de Bem Cavalgar Toda Sela, by Antonio Franco Preto, ed. by S. Mulhberger, Higland Village, The Chivalry Bookshelf, 2005. GIUBBILEI, Carlo, Federico Caprilli, vita e scritti, Roma, Casa Editrice Italiana, 1911. HENRIQUET, Michel, La sagesse de l’ecuyer, Paris, L’oeil neuf Éditions, 2006. PEREIRA, Carlos Henriques, Etude du premier traité d’équitation portugais. Livro da ensinança de bem cavalgar toda sela, Paris, L’Harmattan, 2001. PEREIRA, Carlos Henriques, Le traité du roi D. Duarte: l’équitation portugaise a l’aube de la Reinassance, in AA. VV., Les Arts de l’équitation dans l’Europe de la Reinassance. VIIe colloque de l’Ecole nationale d’équitation au Chateau d’Oiron (4 et 5 octobre 2002), Arles, Actes Sud, 2009, pp. 140 -150. 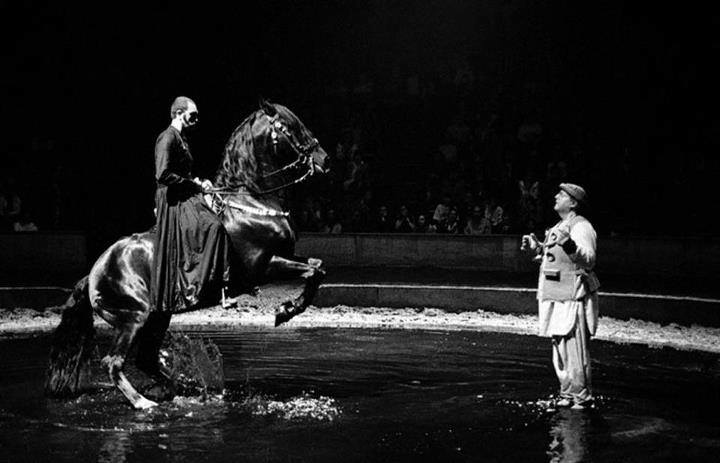 PEREIRA, Carlos Henriques, Naissance et renaissance de l’equitation portugaise, Paris, l’Harmattan, 2010. Thank you for your appreciation. Please, keep on following my blog. We will keep in touch! Awesome Tina! What a superb article, true, honest and reaffirming that fear is something to be respected, accepted and overcome gently! Veramente un gran bel pezzo! Complimenti! Grazie Umberto. Il tuo apprezzamento mi fa molto piacere. Spero che continuerai a seguirmi e a inviarmi i tuoi commenti e i tuoi suggerimenti. Thank you for this post. It is so right on and written so clearly. And so very true! Thank you Kerry! I’m glad you like it. And I hope you will bookmark this website to keep following my blog. Ciao!